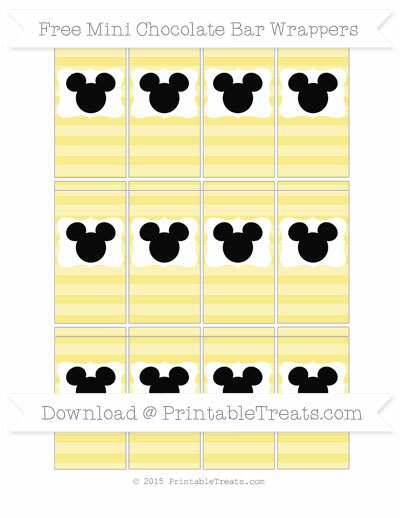 Here are some awesome free printable pastel yellow horizontal striped Mickey Mouse mini chocolate bar wrappers you can use to add some themed decoration to your party candy. These fun Mickey Mouse mini chocolate bar wrappers have a colored background with a lighter colored pattern on top. There is a white label with a Mickey Mouse icon in the center. These mini chocolate bar wrappers are for the small bite sized chocolate bars. I have also posted these wrappers in multiple colors and patterns. You can find them by searching “Mickey Mouse mini chocolate bar wrappers” on the site. Note: PrintableTreats.com is in no way associated with the Mickey Mouse brand. Copyright and trademark of Mickey Mouse belongs to the Walt Disney Company. I’m just a fan doin’ some fan art!